See More Gadgets and Gizmos Here Rugged Android 4.2 Phone with Dual Core CPU, 5MP Camera and IP67 Dust Proof, Shockproof and Waterproof Rating. If you are looking for one hell of a tough phone, then you’ve just found it! 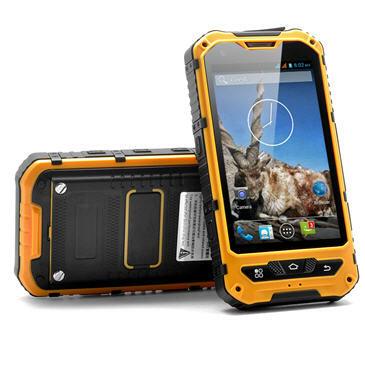 This Rugged Android phone is a very sturdy phone protected by heavy duty casing, it can survive drops to the floor and shocks and is even safe from dust penetration and submersion in water due to its IP67 rating, but strength alone isn’t enough and that’s why this phone comes preinstalled with Android 4.2 and packs a MT6572 1.3GHz Dual Core CPU which can tackle any app. The 4 inch screen offers a conveniently sized and clear viewing experience along with touch functionality to help navigate through the phone. Used by plumbers, carpenters, and construction workers alike, this rugged phone is an indispensable tool. Packing two SIM Card slots you’ll be able to be reached on two different numbers without having to carry two phones and you and have the comfort of a centralized contact list. This professional outdoor mobile phone is designed specifically for tough people who need a tougher phone. Usual colour is as seen in picture, but colour of delivered phone cannot be guaranteed.